All the code for article here . It is abundantly commented out and can serve as a training material for those who already know assembler. Let's start with writing the basic program Hello world! to check the environment settings. Then let's move on to system calls, call stacks, stack frames, and x86 call conventions. Then, for practice, write some basic functions in assembler x86 - and start writing the RPN calculator. at hand. table ASCII . Comments explain the overall structure. List of registers and general instructions can be studied in "Assembler's Handbook x86 of the University of Virginia" . With further discussion of system calls, this is all the more necessary. Then, instead of the above instructions, simply run make. System calls are configured by storing the system call number in the register. eax , and then its arguments in ebx , ecx , edx in this order. You can see that in exit () only one argument - in this case ecx and edx do not matter. A call stack is a data structure that stores information about each access to a function. Each call has its own section in the stack - a "frame". It stores some information about the current call: the local variables of this function and the return address (where the program should go after the function is executed). At once I shall note one not obvious thing: the stack increases down by memory. When you add something to the top of the stack, it is inserted at the memory address lower than the previous one. In other words, as the stack grows, the memory address at the top of the stack decreases. To avoid confusion, I will always remind you of this fact. Instruction push brings something to the top of the stack, and pop carries away data from there. For example, push ex allocates a space at the top of the stack and places the value from register there. eax , and pop eax transfers any data from the top of the stack to eax and frees this area of ​​memory. 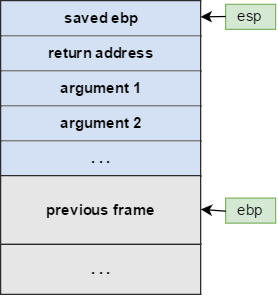 The purpose of register esp - point to the top of the stack. Any data above esp are considered not on the stack, these are garbage data. Running the instruction push (or pop ) moves esp . You can manipulate esp and directly, if you give a report to your actions. 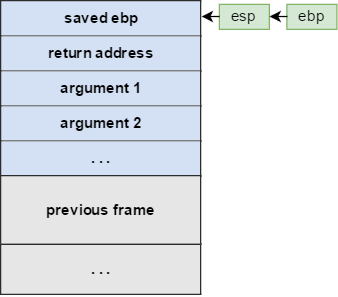 Register ebp is similar to esp , but it always points to the middle of the current frame of the stack, just before the local variables of the current function (we'll talk about this later). However, calling another function does not move ebp automatically, you need to do it manually each time. In x86 there is no built-in function concept in both high-level languages. Instruction call - it's essentially just jmp ( goto ) To another memory address. To use subroutines as functions in other languages ​​(which can take arguments and return data back), you need to follow a convention of calls (there are many conventions, but we use CDECL, the most popular convention for x86 among C compilers and assembler programmers). This also ensures that the subroutine registers are not confused when calling another function. Save the registers on the stack that the caller must store. The called function can change some registers: in order not to lose data, the calling party must store them in memory before putting it on the stack. It's about registers eax , ecx and edx . If you do not use any of them, you can not save them. Write the function arguments to the stack in reverse order (first the last argument, at the end the first argument). This order ensures that the called function gets its arguments from the stack in the correct order. Remove the function arguments from the stack. This is usually done by simply adding the number of bytes to esp . Do not forget that the stack is growing down, so you need to add bytes to remove from the stack. Recover the saved registers by taking them from the stack in reverse order by the instruction pop . The called function will not change any other registers. Save the base register pointer ebp previous frame, writing it on the stack. 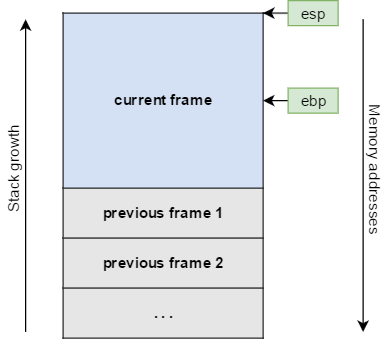 Adjust ebp from the previous frame to the current frame (current value is exp ). Select more space in the stack for local variables, move the pointer if necessary. esp . As the stack grows down, you need to subtract the missing memory from esp . Save the registers of the called subroutine on the stack. This is ebx , edi and esi . It is not necessary to save registers that you do not plan to modify. In these diagrams, a return address is specified in each stack frame. It automatically inserts the instruction into the stack. call . Instruction ret extracts the address from the top of the stack and goes to it. We do not need this instruction, I just showed why the local variables of the function are 4 bytes above ebp , but the function arguments are 8 bytes below ebp . 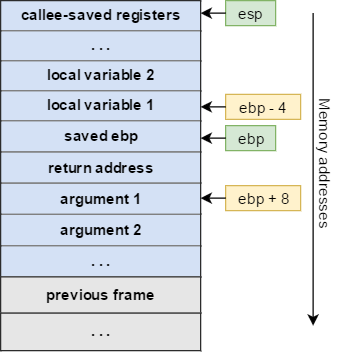 In the last diagram, you can also notice that the local variables of the function always start 4 bytes above ebp from the address ebp-4 (here subtraction, because we are moving up the stack), and the function arguments always start 8 bytes below ebp from the address ebp + 8 (addition, because we are moving down the stack). If you follow the rules of this convention, it will be with the variables and arguments of any function. Recover the saved registers by removing them from the stack in the reverse order. Restore the base pointer ebp previous frame, taking it out of the stack. Having mastered the agreement on calls, you can start writing some subroutines. Why not generalize the code that prints "Hello world! ", To output any lines: function _print_msg . ; the memory is read in 32 bits (4 bytes). ; swears, if you do not specify the size, I do not know why. And let's see the fruits of our hard work, using this function in the full program "Hello, world!". Believe it or not, we've covered all the main topics that are needed to write basic programs in assembler x86! Now we have all the introductory material and theory, so we'll concentrate on the code and apply the knowledge to write our RPN calculator. The functions will be much longer and will even use some local variables. If you want to see the finished program immediately, here it is . For those of you who are not familiar with the reverse Polish record (sometimes called the reverse Polish notation or postfix notation), then the expressions are evaluated using the stack. Therefore, you need to create a stack, as well as the functions _pop and _push for manipulating this stack. You will also need the function _print_answer , which will output a string representation of the numeric result at the end of the calculations. First, we define the memory space for our stack, as well as the global variable stack_size . It is advisable to change these variables so that they do not fall into the section .rodata , and in .data . ; listed at the end of the article. So, how do we display individual numbers in a number? First, note that the last digit of the number is the remainder of the division by 10 (for example, 123% 10 = 3 ), And the next digit is the remainder of the division by 100 divided by 10 (for example, (123% 100) /10 = 2 ). In general, you can find a specific number digit (from right to left), finding (number% 10 ** n) /10 ** (n-1) , where the number of units will be n = 1 , the number of tens of n = 2 and so on. Using this knowledge, you can find all the digits of a number with n = 1 up to n = 10 (this is the maximum number of digits in the signed 4-byte whole). But it's much easier to go from left to right - so we can print each character as soon as we find it, and get rid of the zeros on the left. Therefore, we sort out the numbers from n = 10 up to n = 1 .
mov eax,[ebp+8]; our argument is "a"
; call pow_10 for ecx. Let's try to make ebx as a variable "digit" in C code. It was a hard test! I hope the comments help to understand. If you are now thinking: "Why can not you just write printf ("% d") ? ", Then you will like the end of the article, where we will replace the function with this one! Now we have all the necessary functions, it remains to implement the basic logic in _start - and that is all! As we have already said, the reverse Polish record is calculated using the stack. When reading, the number is written to the stack, and when reading, the operator is applied to two objects at the top of the stack. If the input is a valid postfix expression, then at the end of the calculations there is only one element left on the stack - this is the answer, the result of the calculations. In our case, the number is 30. Now we have all the functions necessary to implement this, let's begin. ; The _start arguments are not the same as in other functions. mov ecx, 0; ecx = "i"
; edx. The rest of the edx is zeroed. And we're done! Surprise all your friends if you have them. I hope that now you will be more receptive to high-level languages, especially if you remember that many old programs were written completely or almost completely in assembler, for example, the original RollerCoaster Tycoon! All the code is here . Thanks for reading! I can continue, if you are interested. Issue an error message instead of segfault if the program does not receive an argument. Add support for additional spaces between operands and operators in the input data. Add support for multi-bit operands. Replace the _strlen on the function of standard library C , and _print_answer replace with the call printf . "X86 Assembler's Guide to the University of Virginia" - a more detailed presentation of many topics discussed by us, including additional information on all popular x86 instructions. "The Art of Choosing Intel Registers" . Although most x86 registers are general purpose registers, but many have historical significance. Following these conventions can improve the readability of the code and, as an interesting side effect, even slightly optimize the size of binary files. NASM: Intel x86 Instruction Reference - A complete guide to all the little-known x86 instructions. To give a guide about that thing which is important for them. Is here i saw in this british essay everyone want important thing which is good and new for them. And which also help them in the many stages of life where they need of that. Photographs are the best approach to express our contemplations yet we can likewise do remarks on different pictures in the wake of seeing them. As in this article, the principal picture is decent yet that ladies must need to decrease her weight and need to pursue some homework for me done on lessening weight in valuable or sound route with no negative effect on her wellbeing as well. Great work and inventive as well.